8 Steps to Problem Solving – Six Sigma is a handy book for those who want to enhance their careers and their organisations. The real-life case studies and the solutions to problems organisations face have been succinctly outlined by Mr. Sharma to help readers drive persistent change and enhancement. Mohit Sharma is a certified Master black belt from Genpact and a certified Black belt & Green belt from ASQ and Motorola university. Lean Six Sigma is my intrinsic passion and a keen area of expertise. He has the privilege of being a member of the ASQ’s Technical Board for reviewing and approving LSS articles and manuscripts. Combining his interest in writing with his LSS bug, he actively publishes White Papers and provides Thought leadership on Lean six sigma for both internal and external publications. In his present role as a Country head quality, is to develop continuous improvement culture in the organization. • Received the prestigious Silver Award at QCI – DL Shah Quality Awards at National level 2016. • Designed and developed six sigma and lean training workshop for Keysight. • Designed and developed DMAIC BB training program, and BPMS (Business Process management System) for Genpact. • Certified Lean Six Sigma Master Black Belt from Genpact, 2013. • Certified Lean Six Sigma Black Belt from ASQ (American Society for Quality), 2008. • Certified Lean Six Sigma Black Belt from Genpact, 2011. • Certified Lean Six Sigma Black Belt trainer from Genpact, 2012. • Certified Lean Six sigma Green Belt Trainer from Genpact, 2011. • Certified Lean Six Sigma Green Belt from Motorola, 2005. This is my first technical book review. 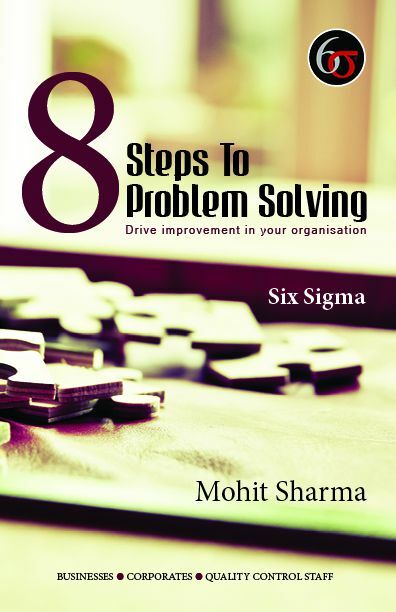 I usually don’t take technical books for review, but the book being on such an important subject, a six sigma green belt, I gave a try to “8 Steps to Problem Solving – Six Sigma” by Mohit Sharma. Master Black Belt (MB) Mohit has given a wonderful cheat book style material to all the people working on the six sigma projects. As mentioned on the cover, the book is dedicated to quality control teams. The book is direct to-the-point, a complete six sigma course material. All lengthy explanations in usual books on six sigma are given as compact pointers. The content is divided into 6 chapters. Each chapter is one step of six sigma project. Starting from project chart/identification to project control, every step is covered with all important pointers. The author has provided more than one example to explain each important point. The book reminded me of a marketing book by Kohler. Common mistakes in six sigma project – Mistakes could be due to system or person. The author has warned MBB and BB what not to do. Tool explanation – Six Sigma projects become cumbersome if we have to calculate each and every parameter manually and prepare charts manually. Tools are the necessity. Minitab and MS Excel can help Six Sigma projects a lot. Rohit has shown how to use Minitab for each step properly. Cases – Educational material would be of no use if end user (person learning it) doesn’ know where and when to use it. So cases are a must to explain any academic point. Rohit has made sure to cover this point.